WHEREAS the Municipal Council of the County of York did, on the 19th day of June, 1872, enact a By-1aw (No. 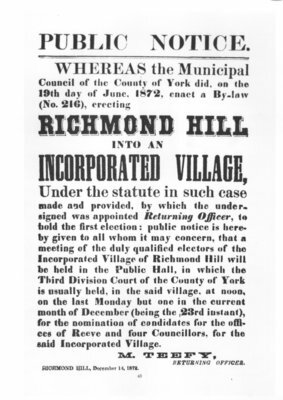 216), erecting Richmond Hill into an incorporated village under the statute in such case made and provided, by which the under, signed was appointed Returning Officer, to bold the first election : public notice is hereby given to all whom it may concern, that a meeting of the duly qualified electors of the Incorporated Village of Richmond Hill will be held in the Public Hall, in which the Third Division Court of the County of York is usually held, in the said village, at noon, on the last Monday but one in the current month of December (being the ,23rd instant), for the nomination of candidates for the offices of Reeve and four Councillors, for the said Incorporated Village. RICHMOND HILL, December 14, 1872.